Adelaide Food Central was invited to sample the new menu at The Stag Hotel on the corner of Rundle Street and East Tce. Chef Joshua Barry introduced us to his large pub menu, which included a combination of entrees, mains, salads, burgers and desserts. 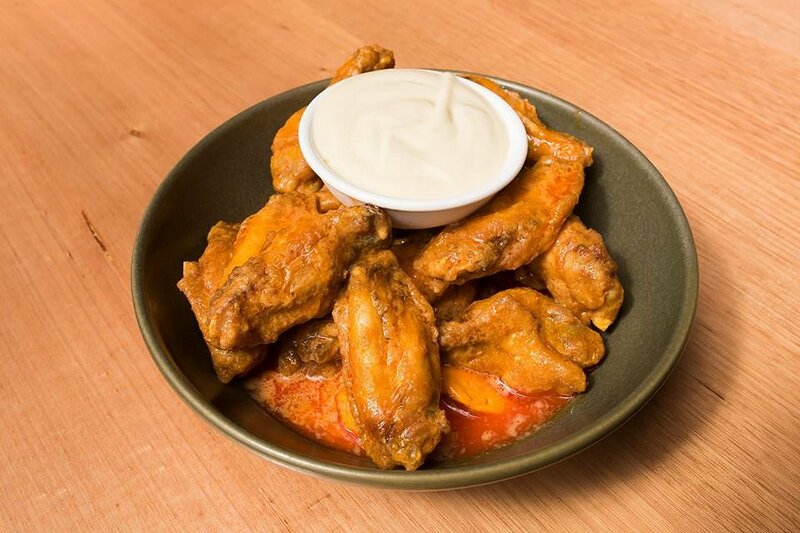 American Buffalo Wings – crisp fried wings in buffalo sauce served with blue cheese aioli. Buffalo wings are a favourite of ours at Adelaide Food Central and we were extremely happy with the quality of these wings. The buffalo sauce was to die for, not extremely spicy but enough to give the sauce some heat and flavour. The tasty coating, the tender wings and the blue cheese sauce was a perfect combination for this scrumptious entrée. Garlic Bread – garlic butter and fresh herbs on focaccia with mozzarella cheese. 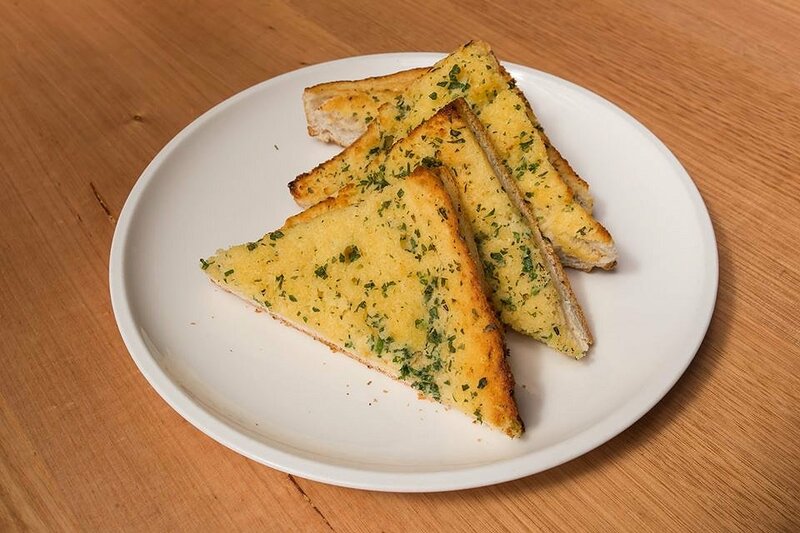 Who knew that garlic bread could be one of the highlight dishes? Such a simple combination of the three elements made a tasty dish. The melted cheese combined with the butter made the bread rich and delicious. The crisp focaccia bread added that extra delightful crunch. 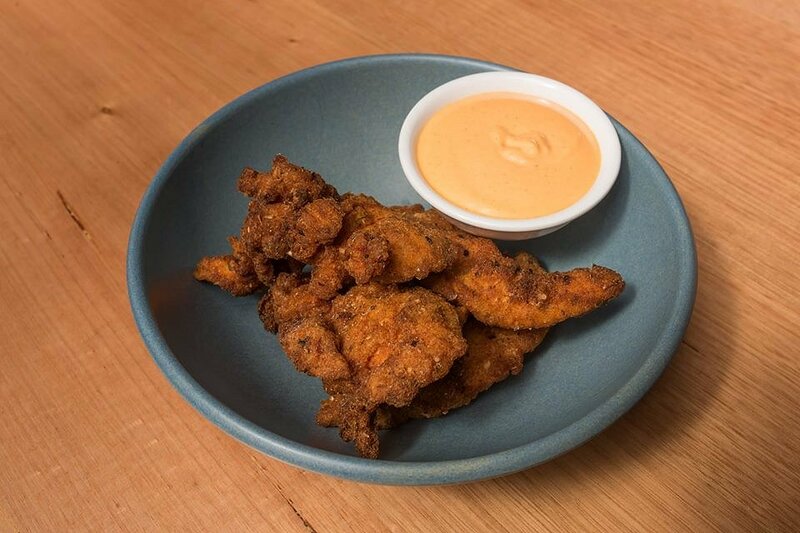 Southern Fried Chicken Tenders – buttermilk soaked chicken in a crispy coating served with shirracha and lime aioli. It is sometimes found that fried chicken tenders can be very oily and resemble the likes of KFC. Do not get me wrong KFC is delicious, but when ordering at a pub you expect something of a little higher quality. The southern fried chicken tenders at The Stag are far from KFC standard, and resemble that of good quality chicken. The coating that surrounds the chicken was extremely crisp which could be heard when biting into the tenders. Stag Burger – Minced steak patty, Jack cheese, double smoked bacon , caramelised onion, pickles, lettuce, tomato and aioli on a toasted brioche bun. All I can say is that The Stag know how to make a mean burger. The patty was moist and complimented the strong Jack cheese and smoked bacon along with the crisp and fresh vegetables. 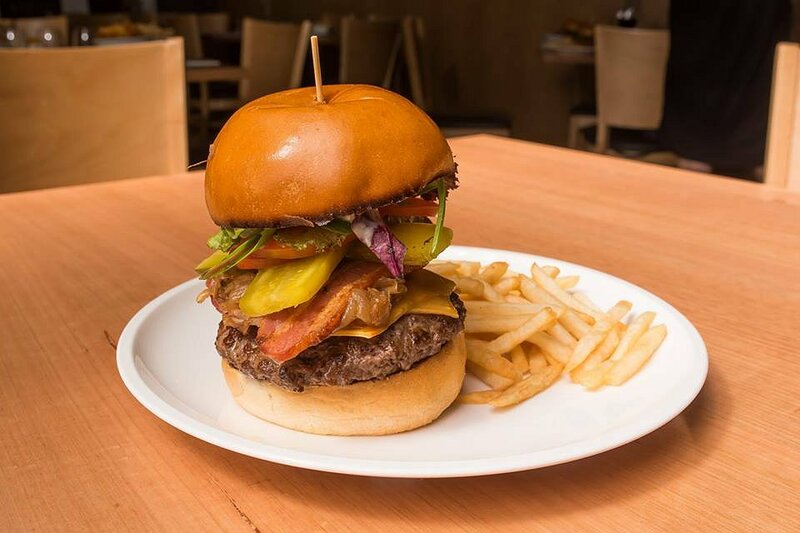 The brioche bun was toasted perfectly to hold all the elements of the burger together. 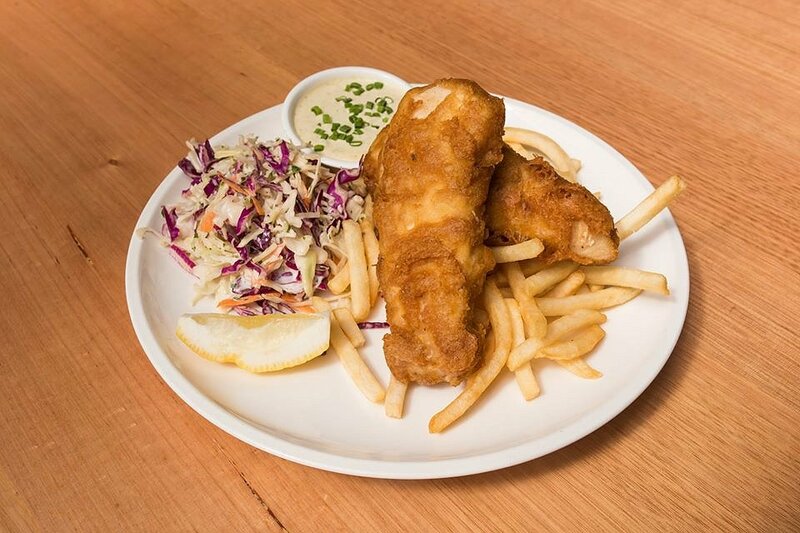 Fish and Chips – locally caught fresh fish crumbed, grilled or battered served with lemon and tartar. Once again you can tell that the produce used in this dish is of a high quality. The fish itself was extremely fresh and cooked to absolute perfection. The batter used had a golden crunchy crumb and complimented the subtle flavour of the fish. 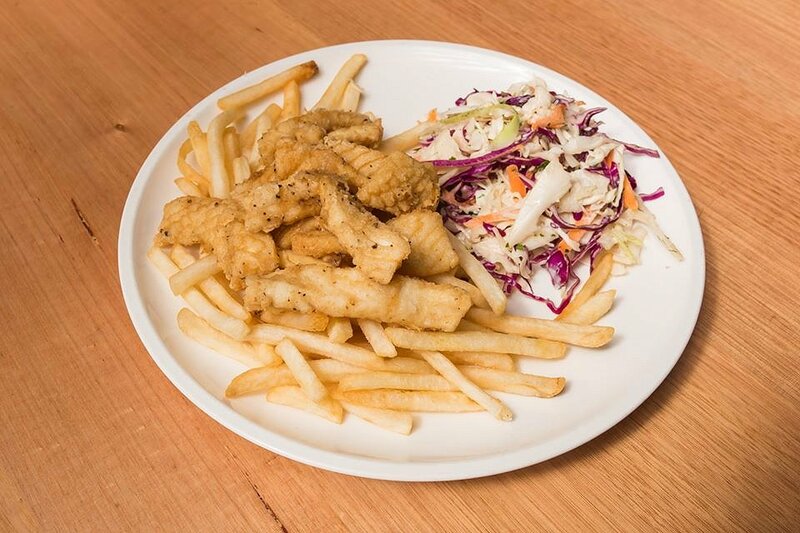 Salt and Pepper Squid – Australian squid lightly coated served with lemon and aioli. This dish has always been a favourite of mine and I have been lucky enough to sample this dish from their previous menu. The squid is coated in a light batter and is cooked to perfection, not too oily, but enough for the batter to have a crunchy and crisp coating. 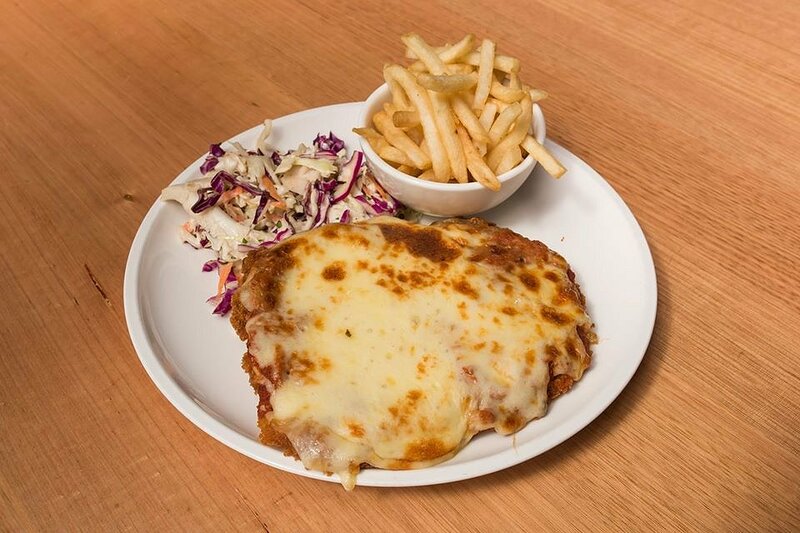 Chicken Parmy – butterflied chicken breast lightly crumbed or tenderised beef topside lightly crumbed, topped with Napoli sauce and mozzarella. How can you go to a pub and not order a chicken parmy, my absolute go to and favourite pub menu item. The beautiful tender chicken breast was crumbed lightly which we liked, as sometimes the crumb can be way to thick and over powering. The chicken and crumb is then topped with a rich napolitana sauce and cheesy mozzarella. 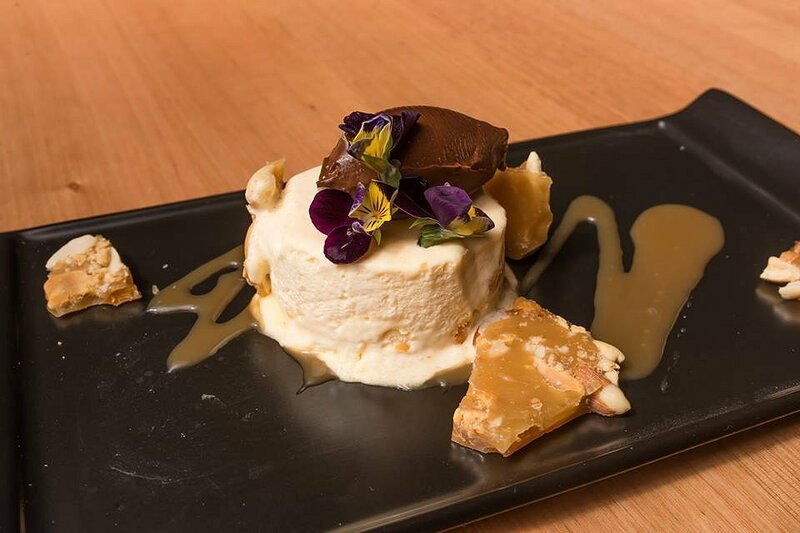 Peanut Butter Parfait – peanut butter parfait milk chocolate cremeux, salted caramel and peanut brittle. So much peanut butter goodness in one delicious dessert. Parfait is one of my favourite desserts and with the mix of peanut butter and salted caramel how could I say no? The delicious crunchy peanut brittle had a fantastic texture that paired well with the soft, cold parfait. We would love to thank all the staff at The Stag Hotel for cooking up and serving an absolute storm. Chef Joshua Barry has done an awesome job at crafting the new menu that provides something for everyone.